Why limit delicious barbecued food to only when the weather is nice, most electric barbecue grills can be used indoors and outdoors so you can enjoy your barbecued food all year round! Unlike gas BBQs or charcoal BBQs, electric BBQ grills are a lot easier to operate but of course they have their weaknesses too. An outdoor electric barbecue can be healthier as many grills are designed to reduce the amount of fat. 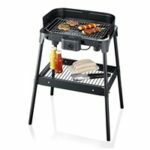 In addition, an electric barbecue grill with a stand that’s removable is very compact and is perfect for outdoor use with its stand, or you can remove the stand and use just the grill for indoor use. 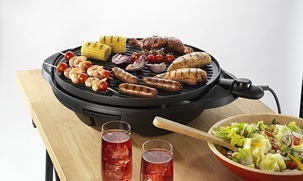 For those who enjoy dining on their balcony, then an electric BBQ grill will be a great addition. 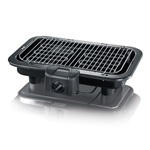 This can be used to cook food on your balcony, so you can enjoy eating on your balcony bistro set. Despite not having the traditional charcoal taste that many say charcoal BBQs provide, an electric barbecue is much quicker to set up and clean afterwards. If you’re unsure what type of BBQ would be the most suitable then you can see our comparison below outlining the pros and cons. 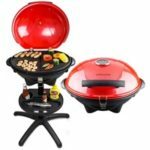 Should you have any difficulty in choosing the best electric barbecue grill, knowing the applicable features and what each feature does should help you narrow down your options. So we’ve listed the features shown in the table below and have explained what each one does and what it’s used for. Power – Measured in wattage or watts for short, the higher the watts the more power and quicker the grill can cook food. Although you can adjust the thermostat if you want to cook your food slowly. Thermometer – The thermometer will tell you the temperature at which the food is cooking at, this will enable you to monitor easier that your food is being cooked at the correct temperature. To be certain your food isn’t undercooked or overcooked, you should use a meat thermometer since this is among one of the useful barbecue tools. Hood/lid – Having a hood or lid to cover the food whilst it’s cooking helps to trap heat and will speed up the cooking time. Drip tray – A lot of the grease and fat from the meat will drip into the drip tray so your food doesn’t get marinated in it. The drip tray can then be removed so you can dispose of the unwanted grease and fat. 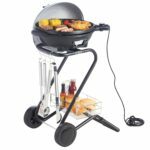 Warming rack – It is not really common to have a warming rack on electric barbecues, as most of the barbecues are more compact leaving no room for it. A warming rack is used to keep food warm and if there is one, it’ll be located just above the main grill, so the heat from the grill can keep the food warm. Remove the stand and use it anywhere! Storage space – If it comes with a stand there might be space to hold things like sauces which could be used as part of the cooking process. 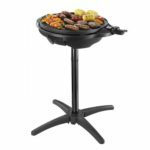 Removable stand – Removing the stand makes it a more portable electric BBQ, making it easier to use it indoors or on trips away. If you’re planning to take it with you on camping trips and you have no access to a plug socket then a portable electric generator might be a good option as this can also be used to power other devices or appliances. Indoor/outdoor use – Being able to use the barbecue grill indoors or outdoors gives you more flexibility as you won’t be depending on the weather! Dimensions – Many of the designs are quite compact compared to outdoor barbecues. If you’re going to be using it indoors, check the dimensions to see if you have enough room on the kitchen worktop or table top. One of the questions you might ask yourself is what type of barbecue to go for? As gas BBQs are very popular we’ll compare this against an electric one, listing the pros and cons below. Many models are very portable and lightweight so you can take it to many places with you. Can be used indoors or outdoors unless the model specifies outdoor use only. Ideal for places where there’s no garden access such as an apartment. Prices start quite low, making it very affordable. Provides a less authentic taste. Temperatures do not get as hot, which means food takes longer to cook. Usually has more grilling space to accommodate for larger groups. More popular with plenty of sizes and styles to choose from. Easy to maintain high temperatures which is required to cook certain meats. Provides a better flavour but not as authentic as the charcoal. Quick and easy to start up.